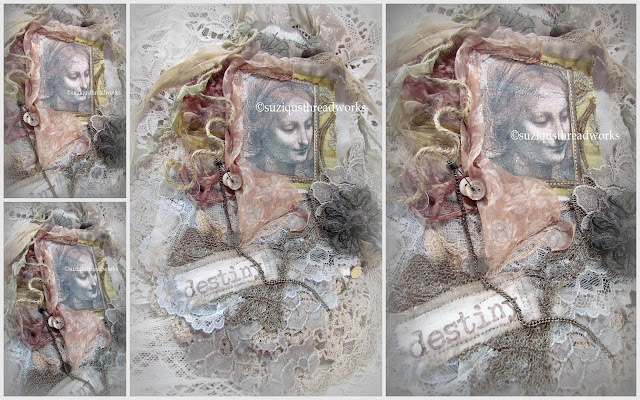 Fabric Lace book / Journal "Peaceful and Pondering"
anytime you wish as it is open ended! her and view her beautiful stitching. of what is just opening up. beautiful fragrance from these blossoms enter. Oh these glorious Magnolias are growing sky high! I will see where it leads me! Congratulations to Freda and thank you Suzy for the opportunity to have entered. Your garden photos are exquisite and I look forward to seeing your new creations. Your Spring blossoms are magnificent Suzy - good for the soul to see some beauty after a long grey winter. Your new creation looks and sounds interesting - can't wait to see. Tomorrow yea - I had a mad rush to town as my printer wasn't working... all fixed so I'm ready now - I can't wait! Suzy, your garden is looking magnificent, especially your magnolia. We had beautiful rain to set us up for a lush Spring. And more due soon, too. All the gest for your class - enjoy your new experience as an online teacher. Congratulations, Freda ... I know you will enjoy. Suzy, your photographs are just beautiful. Springtime is my favorite time of year. Congratulations to Freda ,how wonderful for you !! AND DEAR SUZY ,what a stunning sight from your garden with the magnolia trees in bloom !!! Your new creations are so beautiful, love the way you used your died mohair ,stitched onto the page. You always made my heart flutter when seing your amazing art ,dear you !!! I signed up for you class Suzy! I also can't wait to learn some new techniques too! Love your spring photos too! I am stunned to read that I won your wonderful collage. I couldn't believe it and now I cannot wait to see it. I have been going thru the videos for our new class and it is going to be so much fun to start this project. Thank you for the opportunity to win this and for your generous heart having all the wonderful giveaways. I also should have mentioned that the first flowering tree is just gorgeous. Loved them all but that one took my breath away. Wishing you best of luck with the class. I know your students will adore it! I love watching your garden unfold just as ours are fading away. Congratulations Freda! Yay for you!! I'm certainly looking forward to playing in class - so excited to be able to learn from you Suzy. One More Giveaway and One More Winner!